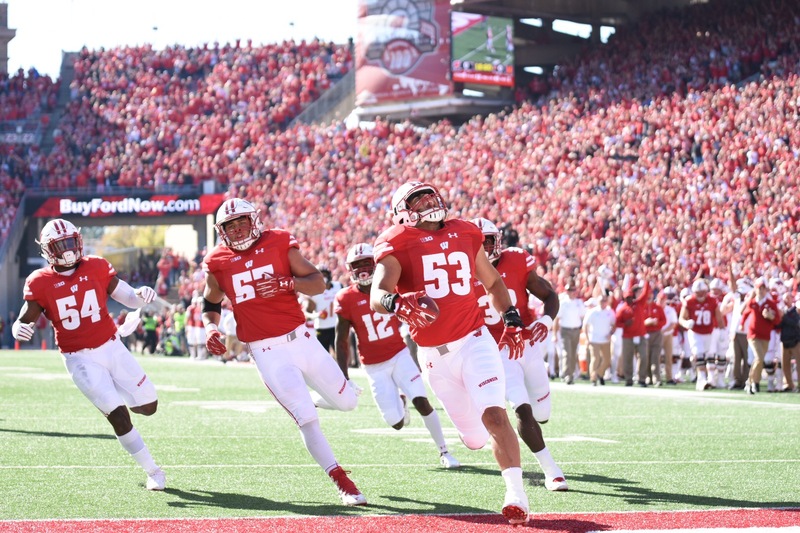 The University of Wisconsin football team went on the road and defeated Illinois during their homecoming 24-10 to remain undefeated Saturday afternoon. Playing through wet conditions for most of the afternoon, Wisconsin once again had to rely on the defense to make plays when it mattered. The defense forced three turnovers in the contest, two interceptions and one fumble. The first interception came on the first drive from the Fighting Illini. After Wisconsin started the game with a quick three and out, Illinois started their first drive with two incompletions before Derrick Tindal intercepted the third-down pass from Cam Thomas. Despite the field position, Wisconsin was unable to capitalize on the possession, once again going three and out before being forced to punt. From there, Wisconsin’s offense started to find their groove. On the ensuing drive, the Badgers drove the ball 92 yards on 15 plays during a drive that lasted over eight minutes long. The drive represented textbook Wisconsin football, with 87 of the yards coming on runs from five different players while the other five yards were from a defensive penalty. Alec Ingold capped the drive with a one-yard touchdown dive to give the Badgers a 7-0 lead at the end of the first quarter. By the end of the first half, Wisconsin had padded their lead to a 17-3 margin off of Rafael Gaglianone’s 52-yard field goal in the final seconds of the second quarter. 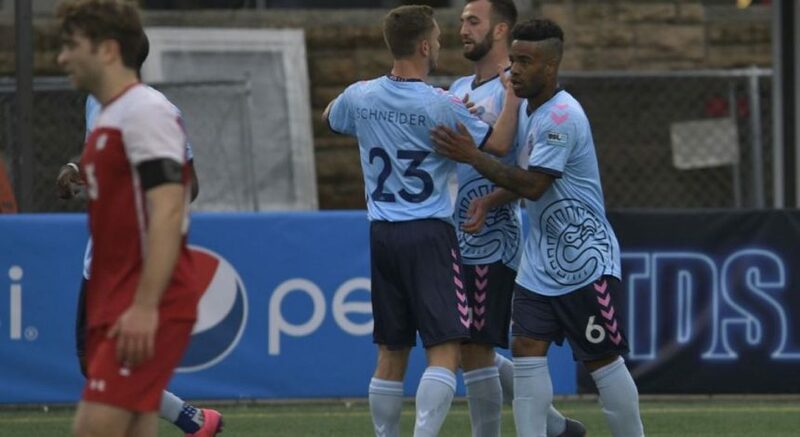 In the second half, neither offense was able to move the ball. 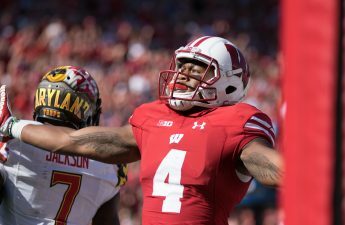 Both teams were unable to score until Wisconsin pulled a trick play to seal the game with a 24-3 lead with less than five minutes remaining on the clock. On the play, quarterback Alex Hornibrook took the snap from under center and rolled out right. After a couple steps, Hornibrook spun around before tossing the ball backwards to left tackle Michael Deiter, who had blockers lined up in front of him and was able to run into the end zone untouched. Despite the win, Wisconsin showed some of the same struggles on offense they’ve been showing all season. In the first drive after Wisconsin’s touchdown, the offense had driven the ball 30 yards to get the ball near midfield. But on second and seven, Hornibrook missed Illinois defensive back Bennett Williams dropping back in coverage, who was able to easily intercept the pass intended for Troy Fumagalli. Hornibrook has now thrown seven interceptions in the team’s last five games, a growing concern for the Badgers’ offense. 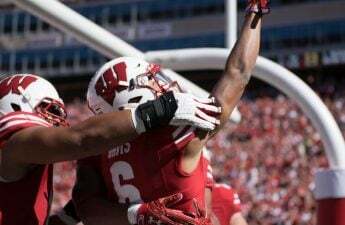 Between Hornibrook’s struggles and the wet conditions, Wisconsin found themselves relying heavily on the running game to move the ball. Jonathan Taylor, Garrett Groshek and Bradrick Shaw all had 12 carries in the game to combine for 164 rushing yards. Taylor led the way with 73 rushing yards while Groshek had 51 and Shaw finished with 40. It was the first time this season that Taylor failed to rush for at least 80 yards. In the end, Wisconsin managed to stay undefeated as they continue their march through the relatively weak Big Ten West. Next up for the Badgers is a cross-divisional showdown on the road with Indiana before they return home for consecutive home games against Iowa and Michigan.